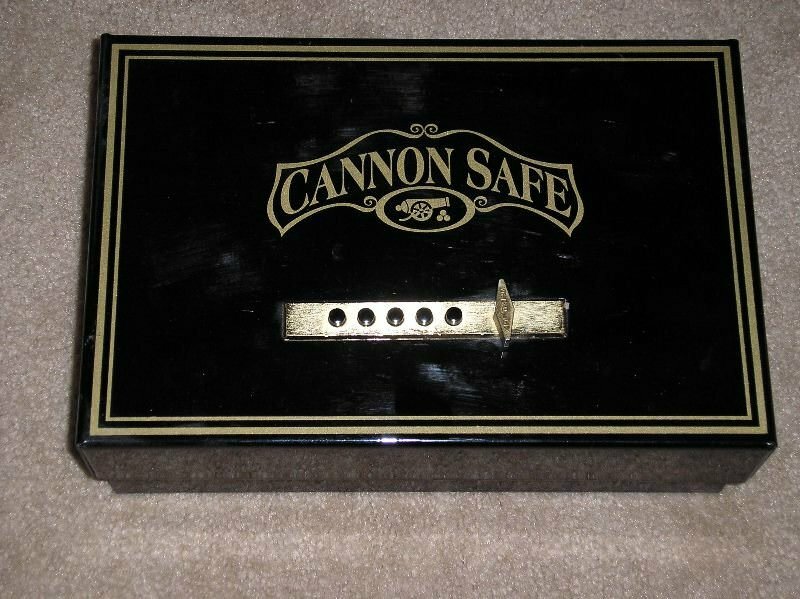 Cannon Safe opens from the top and can be bolted to the floor or to a wall. Those of us with children understand the safety requirements for gun ownership. We don’t want unauthorized access to our handguns, which could result in a family member or neighborhood child being accidentally killed because they found a loaded home protection handgun unsecured in a closet, in a nightstand, under the bed, under a car seat, etc. In most States, if a gun owner does not secure a firearm properly and a minor gets access to the firearm, causing injury or death to another person, the gun owner can be charged with criminal negligence or worse. As gun owners, we must take responsibility to secure our handguns more seriously, but at the same time not hinder our ability to access our handgun in time of immediate need. It must be secure and prevent unauthorized access by anyone but me or someone that I trust. It must not require a key because keys can be lost and duplicated too easily, which slows access to my handgun. 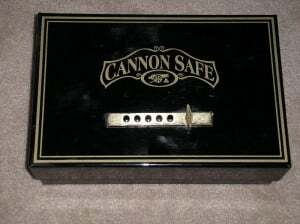 It must not require batteries to open the safe because batteries die when you need them the most. I must be able to unlock the safe in the dark, by touch, and within a few seconds. It must have versatile mounting options. This effectively eliminated all but one type of locking mechanism, which is the Simplex lock. It is the only lock that can pass all of the above requirements. I have not found anything that compares to the Simplex lock. If you have found something better, I would like to hear from you. There are a lot of different handgun safes on the market, but only a few are using the Simplex lock mechanism. It is simple, fast to access, very dependable and very secure. There are no batteries to die out, no keys to lose or fumble with in the dark, and no rolling tumblers that are hard to see and slow to open in a time of need. The Simplex lock is a manual, five-button lock with a turn knob. See Figure #1. The buttons can be pushed individually, in any order, and/or multiple buttons can be pushed at the same time, resulting in 2200 possible combinations. This is a secure handgun combination lock. This type of lock can even be opened in the dark, or in a mounted position for concealment or opening that makes it hard to visually see the lock buttons (e.g. under the car seat). You can place the fingers of your hand over the lock and up against the lock turn knob for quick, no-visual reference, pushing your own combination with your fingers. All by feel, without having to see the actual buttons! The model in Figure #1 is bolted to a wall (and wall stud) in my bedroom closet. The interior foam was replaced with a wood pegboard to hold two pistols, but the foam inserts also could have been cut to fit and hold the handguns in this wall mount position. 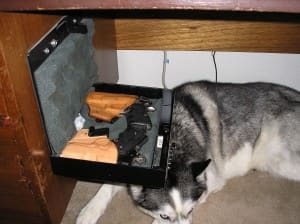 You don’t have to bolt these handgun safes down to a solid, immovable surface, but I highly recommend it because the effort, tools and noise that would be required to steal it will be discouraging to a burglar. In Figure #2, you can see a handgun safe that is mounted under my desk (can’t really see the buttons to push them visually), but it is fast and easy to access, even in the dark. 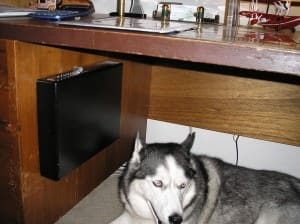 Figure #2: Bolted underneath and on the side of the desk drawers. Figure #3: This particular model opens down, which sometimes interferes with my Husky’s personal space! Another important location for a handgun safe is the car. There are times when I am carrying my handgun that I cannot enter certain buildings/establishments by law or by notice from a merchant. It’s not truly safe or secure to simply put your handgun in a glove compartment, console or loose under a car seat. Even if you lock the glove compartment or console, it is easily stolen with a good crow bar, tire iron or large screwdriver. Also, loose handguns under a car seat can be easily found by a child playing in a car. Do not be complacent about securing your handgun in your car(s). I purchased a Versa Mount Security Box handgun safe that opens from the front-side and is just thin enough to fit under most car seats. (Not all cars have enough space under the car seat for any type of handgun safe because of power seats and/or low mounting of the car seat.) 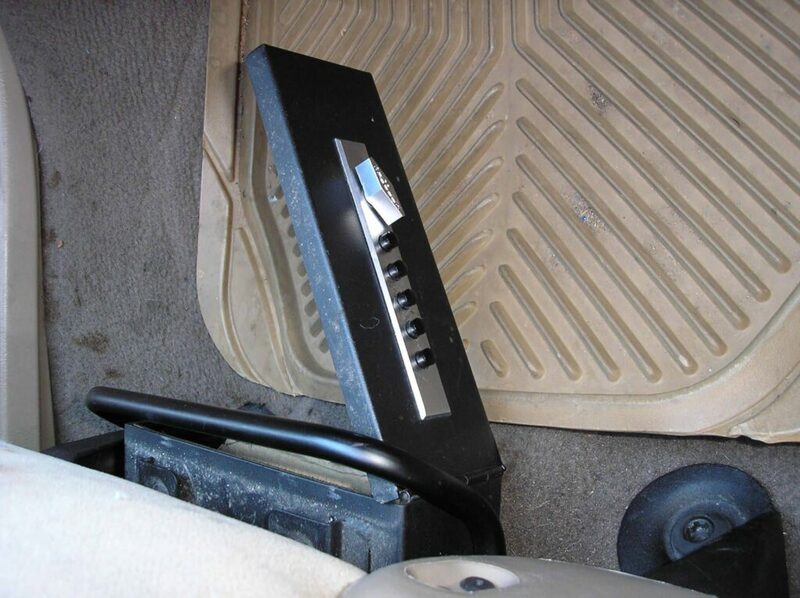 Pictured in Figure #4 is the driver’s seat in a 2002 Ford Explorer (with power seat) and an almost perfect floor mount (bolted to the floor). I had to cut away part of the floor mat to allow the safe door to swing open above the floor mat. I could have added a little more height or front angle to the mount as an alternate. Note: Versa Mount Security Box has mounting brackets on both sides for different mounting options and quick removal or to slide into another car or home location. It came with two mounting brackets. For those of you who are not mechanically inclined or equipped, you should hire a good auto mechanic to do this installation for you. Mounting the gun safe securely under the car seat does require removing the car seat to gain access to the floor for drilling the mounting holes. Be careful that you do not drill through wires or floor vents located under the carpet; and check under the floor and under the car for any fuel lines, brake lines, wires, catalytic converters or other components that could be damaged when drilling through the floor of your car. Again, you may want to have a good mechanic do this installation for you. The Versa Mount handgun safes can be installed inside center consoles with some degree of modification. Again, you may want to have a good mechanic do this installation for you. If you can’t find a suitable front seat or console mounting opportunity, you may have to consider a back seat location, which will not be convenient if you are driving alone and need to get the handgun out of the safe quickly. You have to weigh safety of children and other unauthorized persons accessing a handgun left in the car for whatever reasons. Do not believe that your locked glove compartment or locked console is sufficient. They are not secure enough and you don’t want to take a chance that it is tamper-proof. There are many handgun safes on the market to choose from, but those made with the Simplex lock mechanism are the best for security and fast access. Unfortunately, there are not many manufacturers using this lock mechanism for their handgun safes. I have listed three vendors who use the Simplex lock mechanism in their handgun safes. They both have quality products.